The mining industry’s cyclical nature can be easily seen in the worn countenance of the Central Nevada mining town of Ione. Silver was discovered by miner P.A. Havens in late 1863 on the edge of the Shoshone Mountains. Within a few months, a small settlement had taken root and by January 1864, Ione, then called Ione City, had more than 50 buildings. The name, Ione, was apparently taken from another similarly named mining district in California. Residents were so certain that Ione was going to be something big that they petitioned for the creation of a new county, Nye, with Ione as the seat. The Territorial government granted the request and an official county government was created in April 1864. By the end of 1864, some 600 people were living in Ione, which also boasted a post office, two newspapers and dozens of businesses including a stable, several stores and markets, restaurants, saloons, a drugstore and a stagecoach line linking the town to Austin. Ione’s bright future began to dim in 1866-67, when new discoveries in the mining town of Belmont, located about 50 miles southeast, lured away many of the community’s prospectors. In February 1867, Belmont wrestled the Nye county seat away from Ione. Ione’s demise accelerated with the loss of the county seat. By 1868, the population had dipped to about 175 people. Despite additional silver discoveries in the 1870s, Ione never regained its prominence. In 1880, Ione’s population had slipped to 25 and the town’s heyday was over. Residents even changed the town’s name to Midas, in 1882, in the hope that it might help create a more prosperous image for the community. Ione never completely vanished despite a bad fire in 1887 that destroyed many of its remaining buildings. Mining continued into the late 1890s. After the turn of the century, however, most of the mines and mills had closed and the post office was shut down in 1903. The town experienced a new mining revival, this time involving the production of mercury, in 1912-1914, and the post office was reopened, this time using the current name, Ione. During the next half-century, Ione managed to hang around, surviving off sporadic mining operations. The post office again closed in 1959 and, to date, hasn’t reopened. Ione’s most recent revival occurred in the early 1980s, with the development of a large gold mining operation by Marshall Earth Resources, Inc. The company, which today owns most of the town, also restored several of the town's original buildings. For example, the old schoolhouse was converted into a general store while the former post office was made into the Marshall Earth Resources offices that were furnished with beautiful antique furniture. As with previous booms, however, this one eventually ebbed and the town has lapsed into a quasi-slumber. A special treat for visitors is the small Victorian-style town park. Encircled with a white picket fence, the park has turn-of-the-century Victorian street lamps. With its large shade trees, the park is a pleasant place for a picnic or to enjoy Ione's quiet ambiance. The town's main business is the Ore House Saloon, a restaurant, gas station and bar that seems to have a seasonal schedule (depending on mining activity) and isn't always open. Wandering around Ione, you'll also find other interesting sights, including, just north of the general store, a corral filled with a half-dozen buffalo. A sign warns not to get too close to the wooly animals, which do not appear to be particularly friendly. 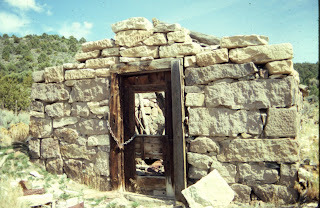 North of the park, you will find other remnants from old Ione, such as an aged, wooden corral fence, an old wooden barn-like building (rumored to have served as the original Nye County Courthouse), several stone cabins, as well as half-buried dirt and grass structures that were once used as miner's residences, like the one pictured above. The nearby Ione Valley is also notable because historic evidence indicates it once was home to a large, Native American population, which dates more than 5,000 years. To reach Ione, travel east on Highway 50 to Middle Gate (about 40 miles east of Fallon). Turn south on State Route 361 toward Gabbs. Just before reaching Gabbs, turn east on State Route 91 (marked for the Berlin-Ichthyosaur State Park). Continue for 12 miles, then turn north on the dirt road marked for Ione, which is just before reaching Berlin-Ichthyosaur State Park (a place also worthy of a visit). A gravel road northeast of Ione passes over the Ione Summit, before dropping down into the Reese River Valley. From here, it is about 40 miles to Highway 50 and the town of Austin. The second half the journey through Eastern Nevada's magnificent Meadow Valley Wash country begins south of the scenic and historic Rainbow Canyon, about 20 miles from Caliente. So named because of the range of colors found in the rocks of the tall walls lining this long, narrow natural depression, Rainbow Canyon was created by intense volcanic activity more than 34 million years ago. Geologists say that over a period of many millions of years, layers of ash deposits—caused by the volcanoes active in this time—began to settle, and then form into rock called "tuff." Later, these layers began to crack and hot water, laden with additional minerals, flowed into these fault areas, depositing gold, iron, copper, manganese and a number of other materials within the fractures. Rainbow Canyon's broad canvas of colors was created when these mineral deposits stained the tuffs. Iron ores created the red and yellow shades, while copper caused the blue and green hues. The white cliffs are the remains of pure deposits of the volcanic ash. About a million years ago, a volcanic chamber, under much of what is now eastern Nevada, collapsed, creating a large valley that eventually filled with water. Faulting at the southern end of this lake valley later allowed the water to escape and, ultimately, carved the area now called Rainbow Canyon. The presence of water in Rainbow Canyon (a creek continues to run down the middle of the canyon) also helped attract Nevada's earliest residents. Artifacts found in the area indicate the presence of man some 3,500 years ago in Rainbow Canyon. Fortunately, there are still plenty of places where we can still find evidence of both the geologic and prehistoric roots of the canyon. The latter are best represented by the large number of petroglyphs, which are prehistoric rock carvings, that are found in the area. Some of the best of these rock writings can be seen about 17.3 miles south of Caliente. 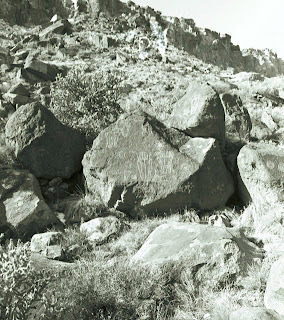 On the slopes of the west side of the canyon are a handful of boulders that have been carved with a variety of symbols and designs, including some remarkable big horn sheep drawings. Farther down the road, on the east side (about 18 miles south of Caliente), are additional drawings depicting circular shapes, squiggles and other intriguing designs. Local folks indicate there are dozens of similar sites throughout the canyon. The drawings are believed to be the work of the "Anasazi" or ancient ones, prehistoric people who resided in the American southwest. The meaning of these carved shapes remains unknown, although many believe they have religious significance related to the harvest and hunt. In addition to petroglyphs, investigators have found other artifacts from these original residents, including arrowheads, baskets, sandal fragments and grinding tools. The geologic history of the area is equally fascinating. At almost any place along the road, you will find the beautiful multi-colored, layered cliff faces that make the canyon so remarkable. A particularly impressive formation is the sheer rock cliffs located about 15 miles south of Caliente. Here, you can find steep, gray cliffs that rise steeply above the road. Only two miles before reaching Caliente is Kershaw-Ryan State Park. This small park is one of the most beautiful in the state and offers picnicking and hiking. Mormon pioneers discovered Rainbow Canyon in the 1870s and 1880s. Within a few years, a handful of ranches cropped up in the area to provide produce and livestock for the booming silver camps at Pioche. In the early part of this century, the canyon was the site of an unusual competition between two rival railroad companies, the Union Pacific and the San Pedro, Los Angeles and Salt Lake Railroad. At one point, the two rail companies were building parallel grades on either sides of the canyon in a race to be the first to complete a line from Los Angeles to Salt Lake City. Eventually, the two companies agreed to joint ownership and a single line was constructed. Since then, the track has been moved several times following major floods as the railroad has sought to find the safest route. For more information about Rainbow Canyon and the Caliente area, go to the excellent web site, www.lincolncountynevada.com. Nevada's geologic history is a crazy-quilt of upheavals, eruptions, faulting and just about anything else that can be done to a place. One of the best ways to see it is on the backroads of eastern Nevada. Eastern Nevada is a geologist's dream with its expressive, multi-colored rock canyon cliffs and massive, layered stone formations that poke through the earth's surface at seemingly random angles. Because the region is fairly remote, it's also still possible to travel these dirt and gravel backroads and see stone formations untouched or influenced by the effects of man. Perhaps the best of these many off-the-beaten-pathways in Nevada is the Meadow Valley Wash road leading north from Glendale (which is 45 miles east of Las Vegas on Interstate 15) to the historic eastern Nevada railroad community of Caliente. The road, which is only accessible with a four-wheel drive vehicle, travels some 75 miles over somewhat rugged dirt roads. The road, located about 2 miles north of Glendale, just off State Route 168, runs parallel to the Union Pacific Railroad tracks for much of the way (be careful to watch for occasional trains since you're literally driving beside the tracks). The trip begins slowly as you pass through typical high desert sage and grass country. Within a few miles you can see, to the right, some beautiful eroded plateaus, which are part of the Mormon Mountains. These deep, naturally-carved mounds, just off in the distance, are the kind of panoramic vistas that only seem to be found in eastern Nevada. Driving along, the ground changes to a more reddish color, reflecting the rich clay content in the soil. At about the 15-mile point, the road enters a different terrain, of canyons and mountainsides. Here, you view some impressive red and brown cliff faces, along with others that are deeply carved, like the lined, weather-damaged face of an old rancher. At about the 24-mile point, the road reaches a yucca-filled canyon lined with crumbled stone cliffs, the surfaces of which are layered like a giant stack of pancakes. Illustrating the tremendous forces that have shaped this land, the layers generally run in a horizontal direction but in uneven lines due to the earth's past movements. Stopping for a moment to admire the scenery, one can't help but be humbled by the immense power of the earth, which can thrust, crack or drop these layered rock sheets upward, then twist them and, sometimes, overturn them. As the road continues to wind through these various canyons and passages, you also wonder how the railroad's designers came upon this route and the incredible effort it must have required to build it. Some of the concrete railroad bridges show dates ranging from 1921 to the 1940s (and a few newer steel spans without dates), indicating this rail line is a living thing, continually requiring upkeep, replacement and care. To accent this point, it's not uncommon to stumble upon a road crew doing some kind of work on the railroad or adjacent road. These bridges cross several marshy areas and small creeks and reinforce the fact that the road runs down the middle of Meadow Valley Wash, a natural plain that has, on occasion, been subject to intense flash floods. Historic records indicate a handful of times the track has actually been washed away. At about 35 miles from the start, the road branches away from the tracks and runs parallel but at some distance. Modest ranches with cultivated fields, horses and cows begin to appear as the terrain flattens out into a wider valley. You can also drive faster now, racing along at 35 miles per hour rather than the previous crawl speeds of 15 to 20 m.p.h. Following another 20 miles of fairly smooth driving, you reach a place called Elgin; be sure to stop at the Elgin Schoolhouse, now a museum filled with vintage furniture and displays, as well as the Bradshaw family's End of the Rainbow Ranch, a small local resort with a fishing pond and picnic areas open in the summer. The ranch, established in the 1880s, offers tasty pick-your-own apples in the fall and boasts it has the only naturally-watered apple orchards in the state. From here, you finally enter the area known as Rainbow Canyon—-but more about that in the next post. About a decade before silver was discovered in Nevada, the West’s first mega-mining boom occurred on the other side of the Sierra Nevada Range near a place called Coloma. In 1839, John Sutter acquired land from the Spanish, erected a fort and started a settlement in Sacramento, which he originally named New Helvetia. The ambitious Sutter envisioned the community as the capital of a great inland agricultural empire. In 1847, he built a sawmill on the American River, about forty miles from his fort, to provide lumber for his growing colony. To run the sawmill, he hired James Marshall. One day in 1848, Marshall was working at the mill when he discovered some shiny rocks in the river water that powered the wheels. He had the stones assayed and found they were almost solid gold. Within a year, Sutter’s sawmill had been abandoned and a mining camp had popped up on the banks of the American River, which was named Coloma. The camp and surrounding area quickly became the focus of one of the most massive influxes of humanity ever experienced in America. By 1849, more than 10,000 people toiled along the banks of the American River and Coloma had grown to 13 hotels, two banks and dozens of other businesses, all opened to serve the miners. Unfortunately, there really wasn’t as much gold to be found in the river as was first thought, and by 1851, the miners began to move on to seek their fortunes in more profitable areas, including Gold Canyon and the Virginia City area in Nevada. Today, the Coloma State Park encompasses nearly all of the historic camp of Coloma. Wandering through the grounds, you can find a handful of restored Gold Rush-era buildings, including a Chinese store, blacksmith’s shop, a jail, an old miner's cabin and several churches. One of the most impressive structures is a full-size replica of Sutter's mill. The site of the original sawmill is nearby, marked by a stone monument. Downriver from the mill is a sign indicating the original gold discovery site. A good place to get an overview is at the Gold Discovery Museum. Inside, you can find displays explaining Marshall’s discovery, the development of the placer gold mining industry in the region and other interesting facts about the park. 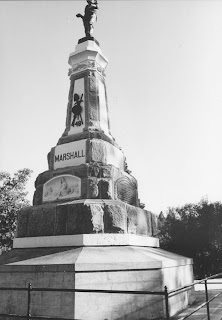 Additionally, if you drive a few miles west of the town and follow the signs leading to the Marshall Monument, you reach a spot above the town that features a large bronze statue of Marshall pointing to the site of his discovery. Marshall never reaped the rewards of his discovery and died poor. He is buried beneath the impressive monument and his modest cabin, which has been preserved, sits down the hill from the statue. Of course, the park is much more than history. Located in a scenic valley on the South Fork of the American River, the park is heavily wooded with oak, locust, persimmon and mimosa trees. Part of the fun of visiting the park is the drive on Highway 49. From Placerville, you travel for about eight miles on a winding road through beautiful wooded countryside. There are several campgrounds and picnic areas in the park, but they get crowded during the summer. The area is also popular for river rafting. Several outfits in the vicinity offer guided trips on the American River. To reach Coloma, head west on Highway 50 to Placerville. Exit on Highway 49 and follow the signs to Coloma, which is eight miles north of Placerville. The Marshall Gold Discovery Historic Park is open daily. For more information call 530-622-3470.